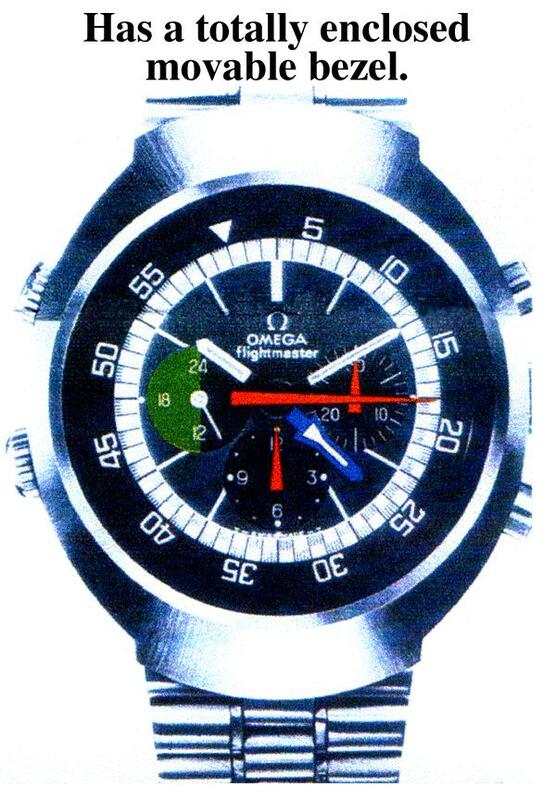 [Recently in the Omega Forum a poster asked for information on the Omega Flightmaster. 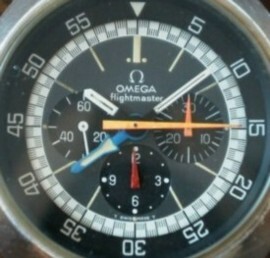 The Flightmaster's are a variant of the Speedmaster line designed, engineered and marketed towards "Pilot-Types" by Omega from 1969 through the early 1970's. 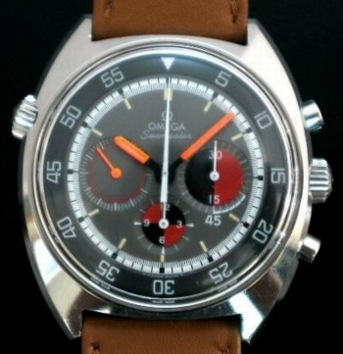 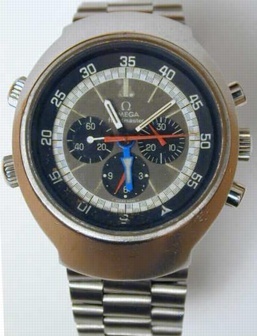 This was the last time that Omega developed a mechanical movement specifically designed for the needs of a pilot. Since then Omega has developed and introduced for sale the Speedmaster Professional X-33 "Mars Watch" which is a Quartz movement watch which is the spiritual sucessor to the Flightmaster. -- Photos courtesy of Eric Katoso's Favorite Omega's Site. 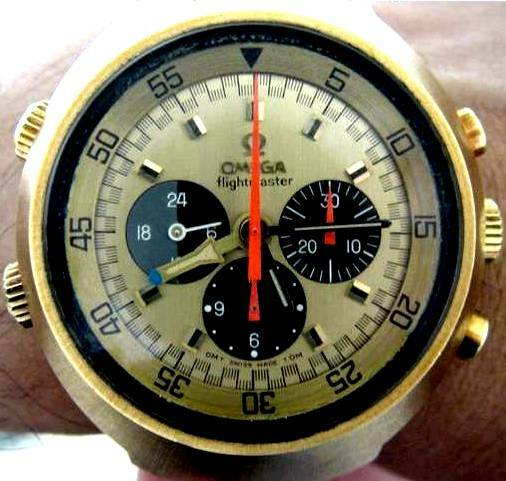 The Flightmaster c.911 (ST145.036) uses the c.861 base Omega manual-wind movement with a 12-Hour GMT hand complication. The hand moves and is set uni-directionally via the auxiliary crown located at 10 o'clock on the case. 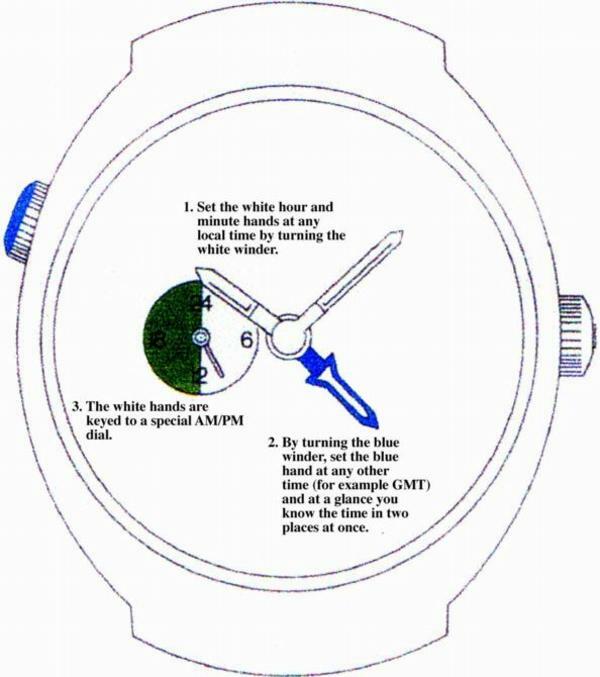 The crown located @ 8:30 on the case set's the under mineral crystal bezel. 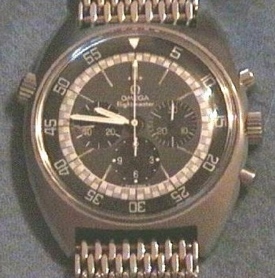 Left side of a c.911 case. Right side of a c.911 case. 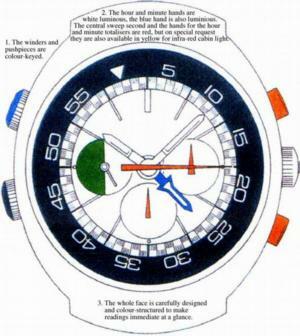 Aside from this the operation of the watch is the same as the moonwatch with a similar power reserve, etc. WR rating from the factory is 60 meters according to sales literature of the era. 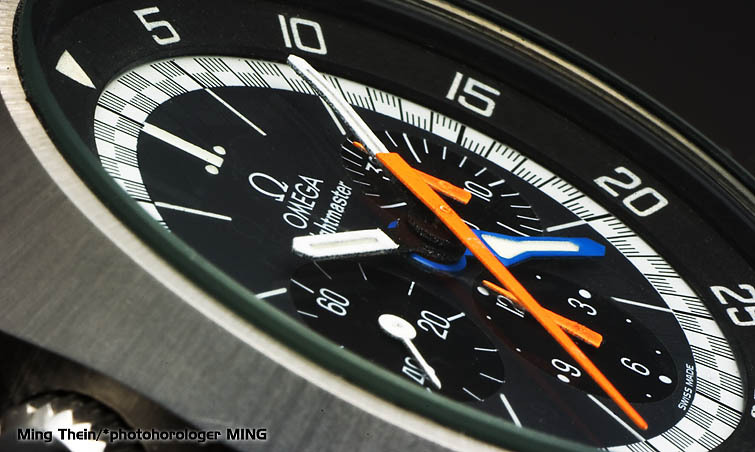 This is in no small part due to the use of a mineral glass crystal instead of a plastic crystal on the moonwatch. 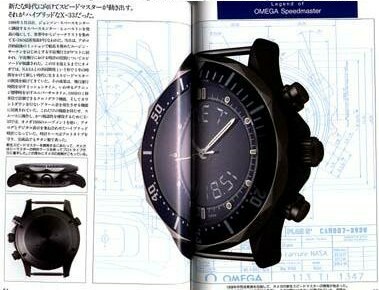 With the The Flightmaster c.910 (ST145.013) the base c.861 Omega manual-wind movement is modified by replacement of the small seconds sub-register at 9 o'clock and with a 24-Hour AM/PM indication. Operation is the same as the c.911 above but with the omission of the small second indicator there is no way to determine at a brief glance if the watch is ticking unless the chronograph is in operation. 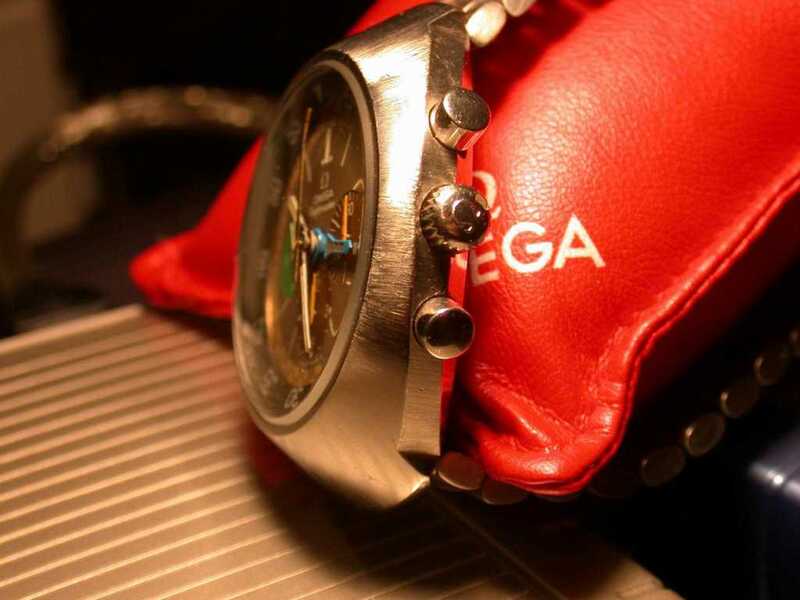 Produced by people with their feet firmly on the ground. 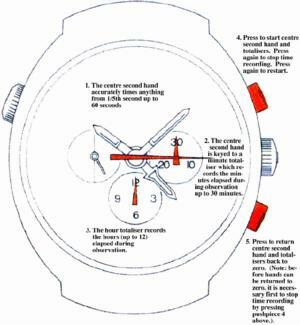 It's easy to produce a chronograph with a revolving bezel and then call it a pilot's watch. 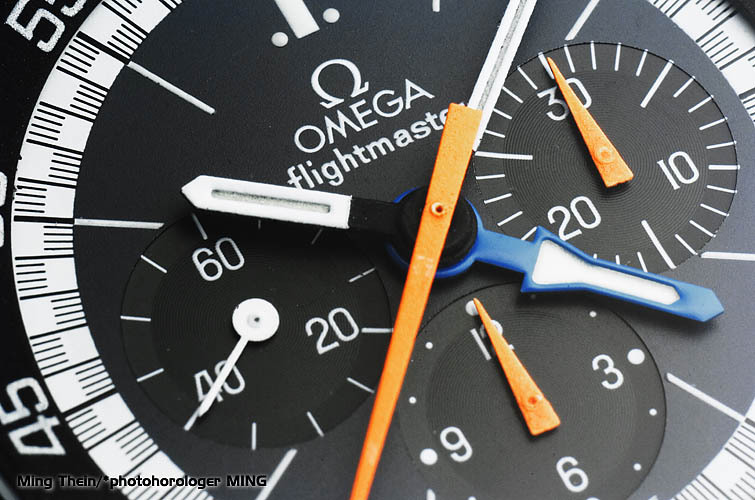 It's not so easy to produce a functional chronograph specifically for the pilot. 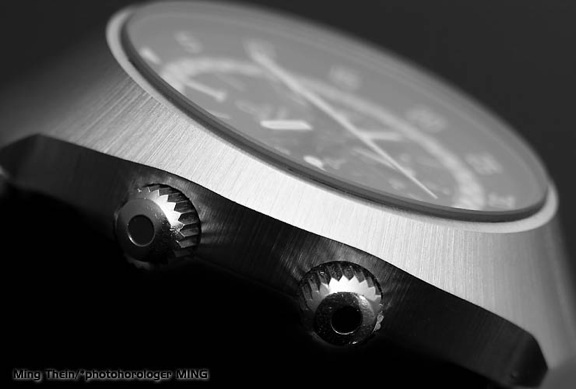 Before we even started to design the Flightmaster we researched the needs of the pilot and then we made sure that we covered those needs - no more, no less. 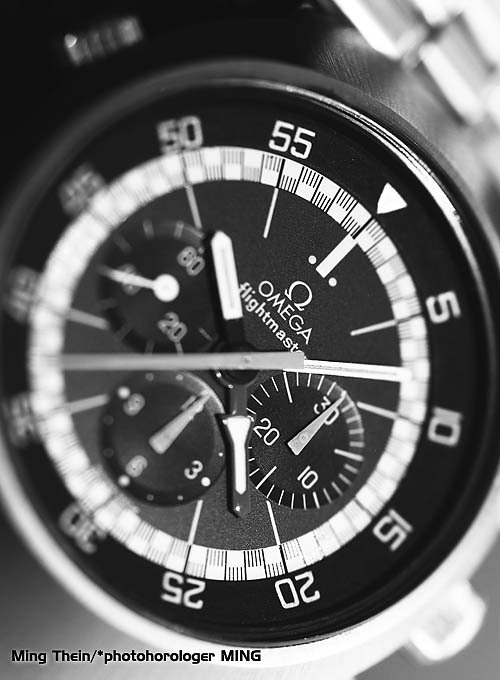 The result is the combined effort of designers already experienced in producing chronographs for the aviation world; and Omega - supremely experienced in the production of precision timepieces which have proved reliable even in the extreme conditions of space travel. Every part of the Flightmaster has been carefully considered and the chronograph born of the research design and development is a practical instrument - specially made for the pilot. Cut from a single block of Swedish stainless steel, the upper case is pressed and tempered sixteen times before it assumes it's unique elliptical shape designed to fit the countours of the wrist comfortably. 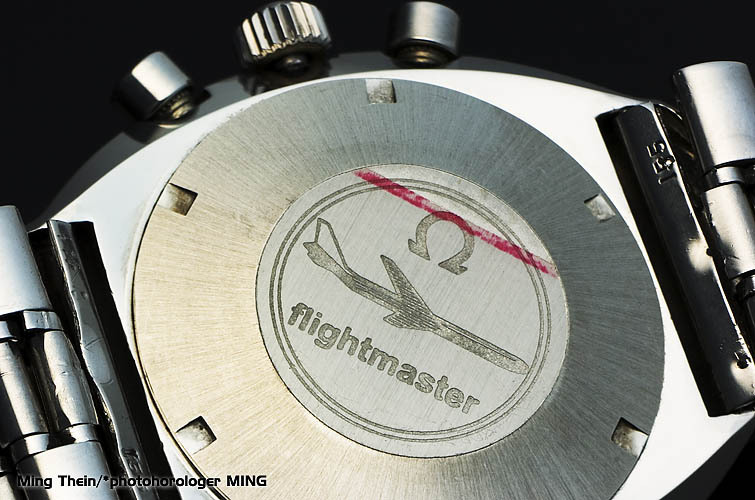 Normally, the Flightmaster is equipped with a stainless steel bracelet. 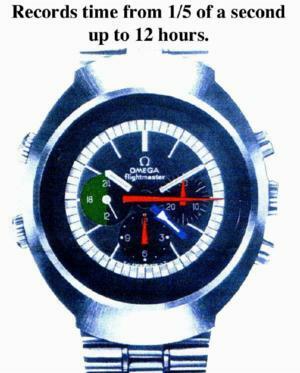 But it also comes with a Corfam® strap. 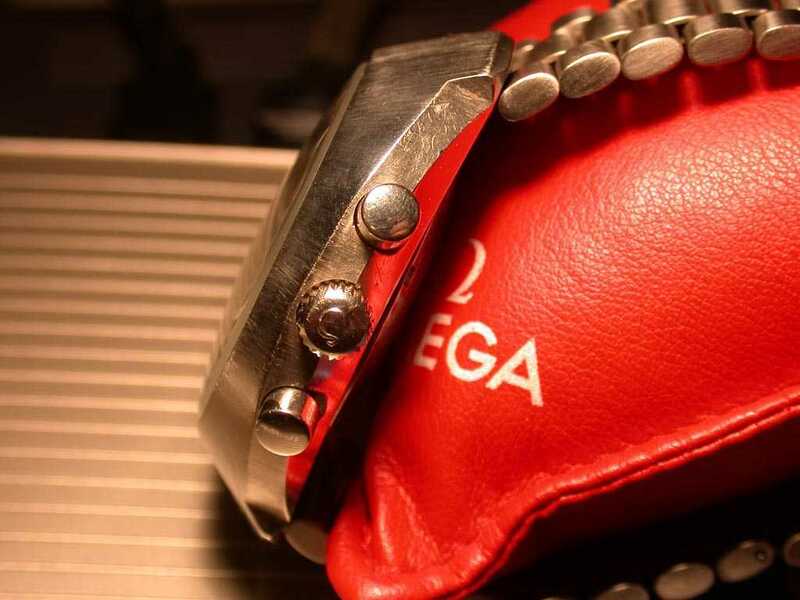 The strap has cool "air-conditioning" holes and is designed with the anatomy of the wrist in mind to assure a firm and comfortable fit necessary with a watch of the Flightmaster's proportions. After the movement has been inserted into the case and the stainless steel back screwed into place, the tempered mineral glass crytstal is sealed in position by a unique jointing system. 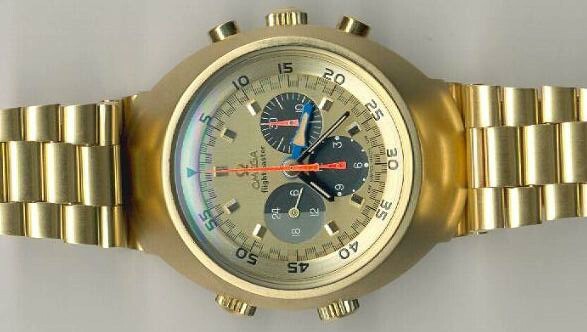 A pilot's watch has many functions so the visual aspect of the Flightmaster is a particular feature. 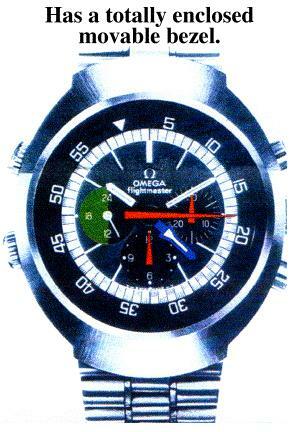 Designed for legibility the time zone hand have been carefully placed to avoid confusion with the whole face colour keyed to strengthen the visual separation. Even the winders and pushpieces have been keyed to the face and although the red chronograph hands are supplied as standard, the Flightmaster is on special request available with yellow hands to allow for where aircraft cabins are lit with infra-red light. The same people responsible for the timeing devices used in the Olympics and by the American astronauts are responsible for the Flightmaster so you knoiw that each of the moveing parts is a piece of precision engineering designed for accuracy and total reliability. The Flightmaster has an somewhat undeserved reputation as being a "Monster-sized" watch. 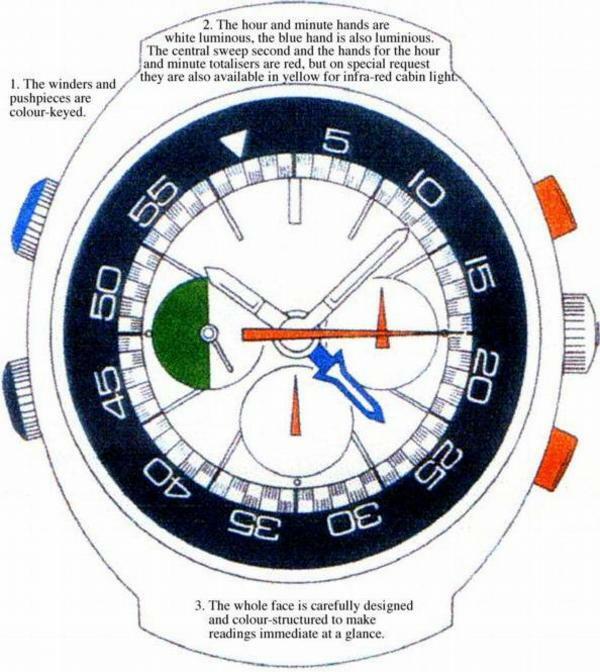 Yes if you look at the Flightmaster's exterior dimensions it is a large watch. 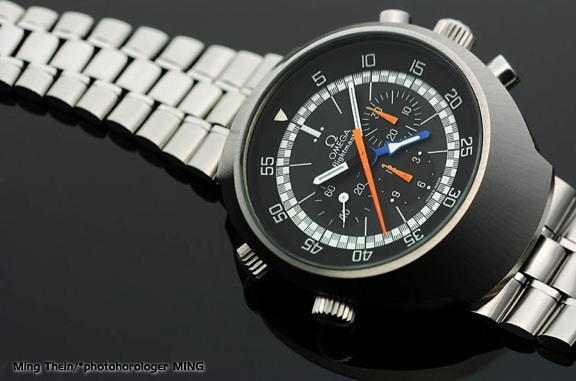 However, similar to the Fender Stratocaster, the Flightmaster's shape and taper actually fits and blends in with the back of the wrist well and wears better than many smaller watches, well... at least in my opinion. 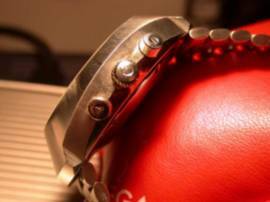 Part of the reason for this are the hidden lugs of the Flightmaster case... 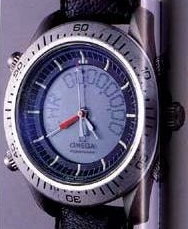 The c.910 AM/PM model's dimensions are modest enough that it actually wears smaller than it's dimensions would otherwise seem. However, the thicker c.911 Small Seconds model wears just as large as it's dimensions would indicate. 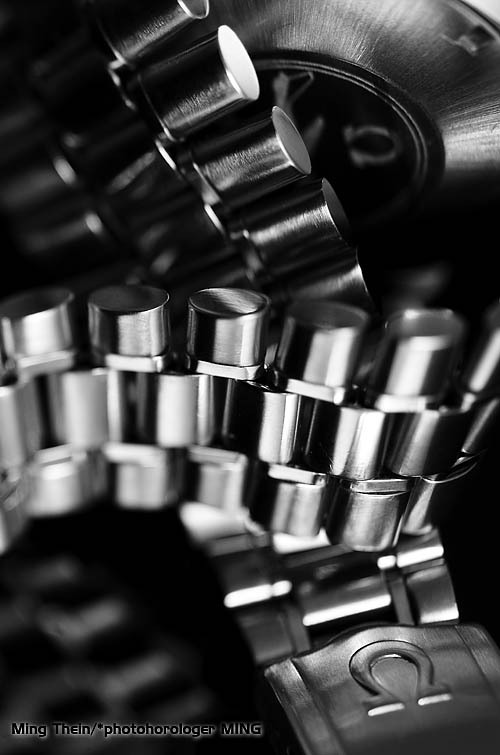 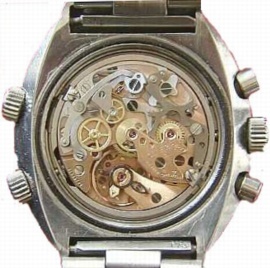 The hidden lugs can be seen via the picture of the movement below left. While it's clear to see the case of the watch is smooth from the top, underneath there is a slot where the bracelet/strap attaches. 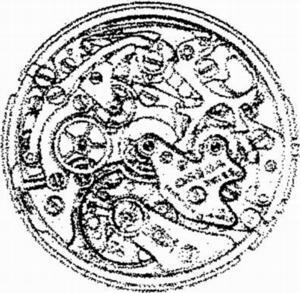 Visually the movements for both the c.910 and c.911 look almost exactly the same. 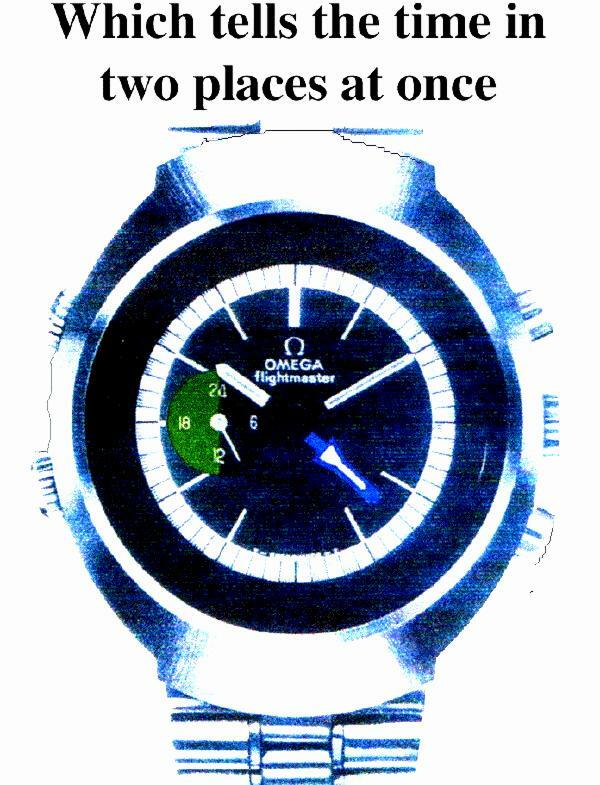 As I don't own an example of each it's difficult for me to compare the two visually. 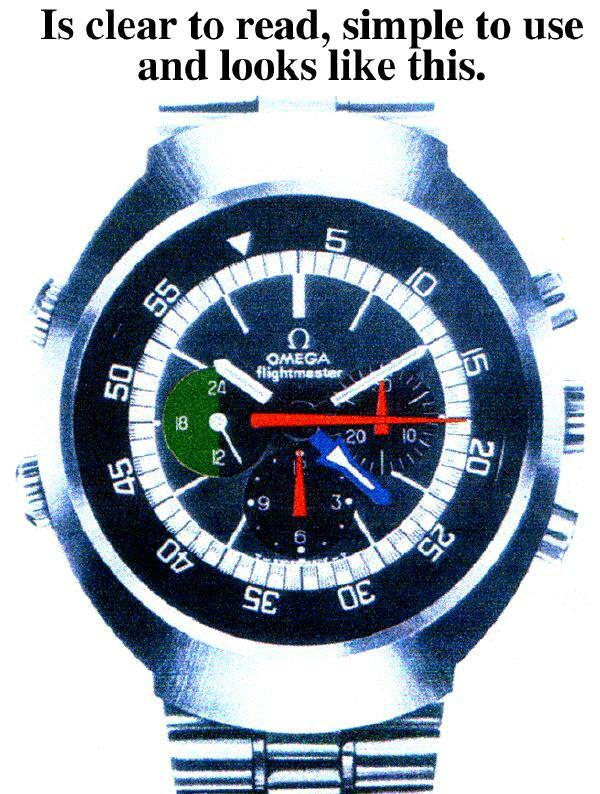 Of course both movements clearly show their heritage of being based on the c.861 Omega movement (Lemania 1873 base movement). 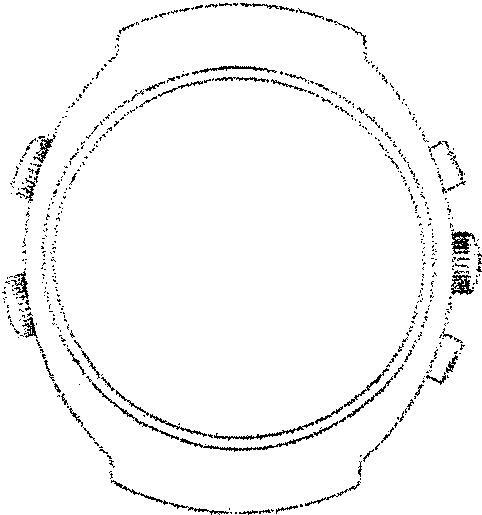 Another common feature across the Flightmaster line is a unique design on the caseback. 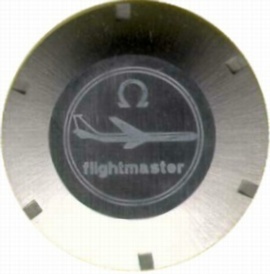 Which consists of an Omega Symbol (logo), a jetliner (looks to my eye to be a DC-8 Super 61), and the name "flightmaster". 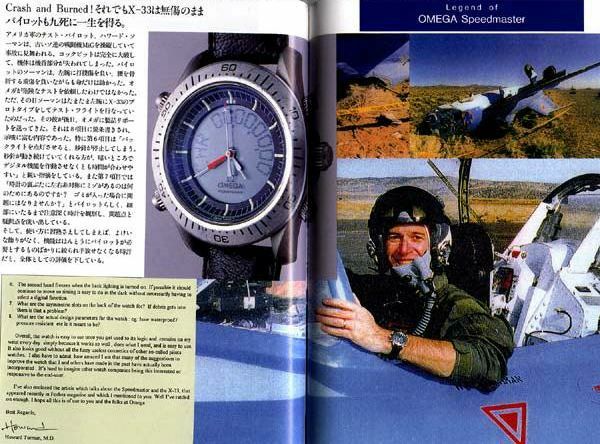 Note that "flightmaster" is not capitalized on the caseback or on the dial. 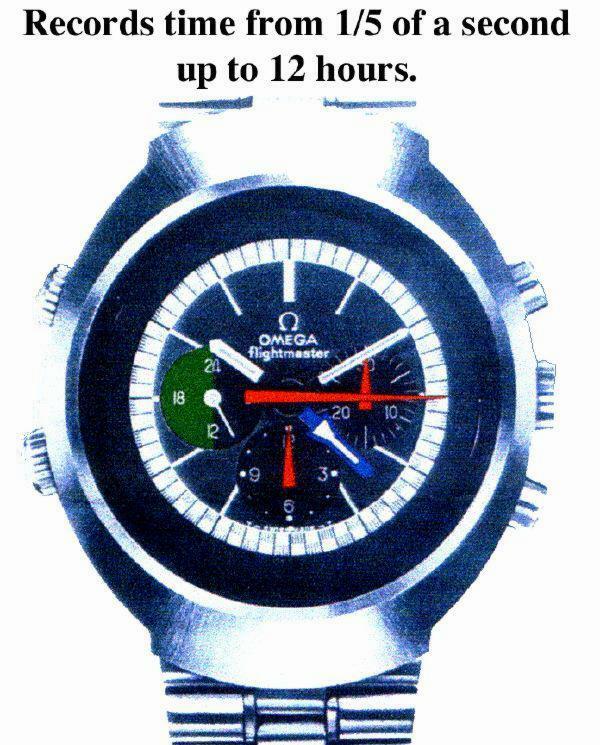 I don't really know why it was not, but it is an interesting item for conversation. 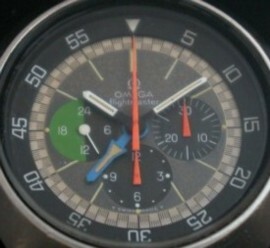 The jetliner on the caseback leaves no doubt to the market's this watch was positioned to sell to. 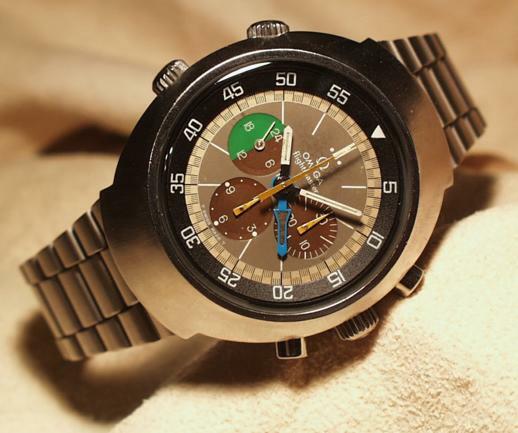 The Flightmaster took it's bow in 1969 and production ran for several years. The stainless steel Flightmasters range in value from $500 or so to $1,300 for a minty condition examples. The Gold Flightmaster c.910 (ST145.013/345.80) along with the Solid gold Seamaster Professional Chronograph, is among the heaviest watches that Omega has ever produced. 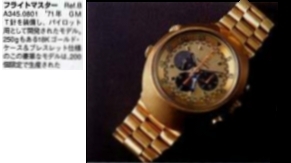 Estimates of a Gold Flightmaster on a Gold Bracelet's heft being in the 240-260 gram range (as shown to the right in a Japanese Language book on Omega Chronographs)... Part of this weight is due to the increased weight of the case, part is due to the gold caseback. 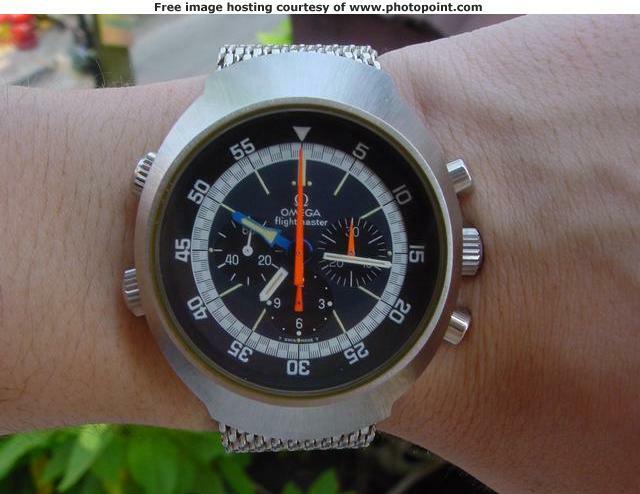 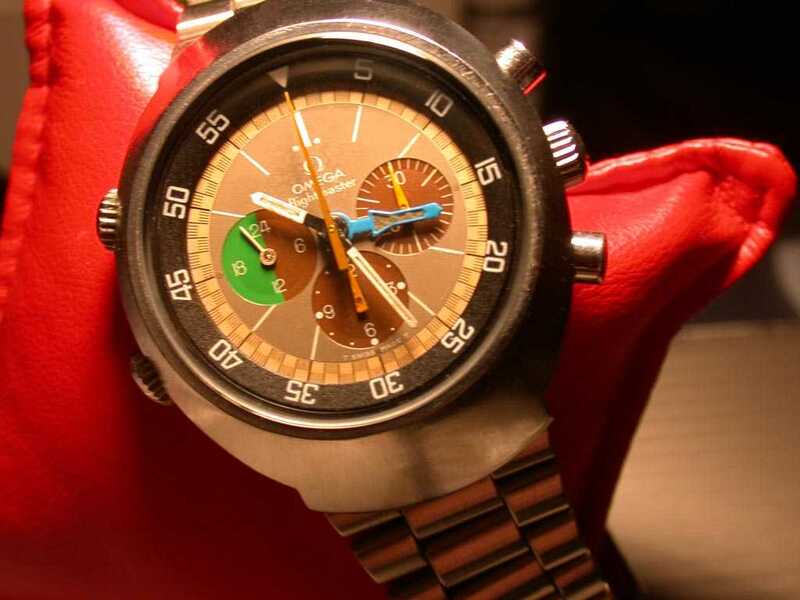 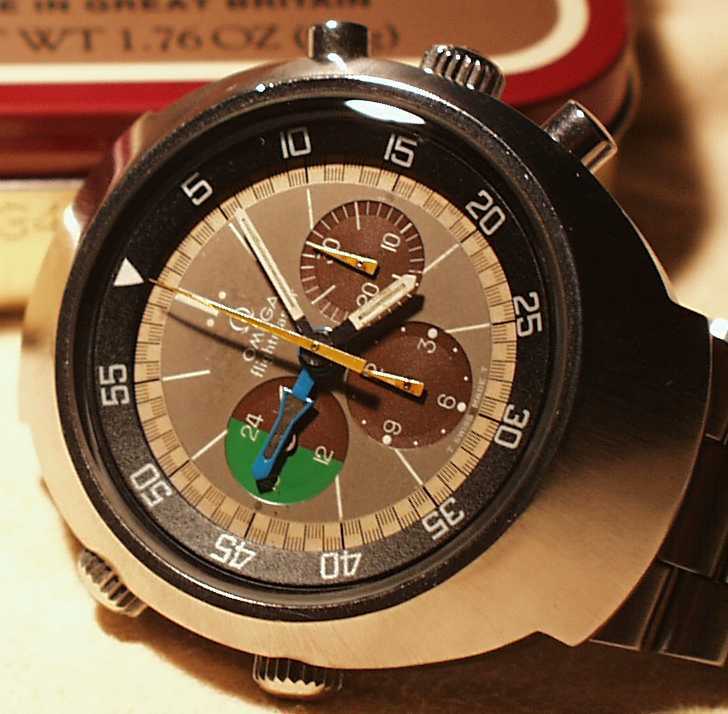 One of the benefits of Detente between the Soviet Union and the United States was the Apollo-Soyuz Test Project (ASTP), and one of the "trickle-down" effects of the Apollo-Soyuz mission was that Soviet Astronauts had access to Swiss Chronographs to wear for a space mission for the first time. 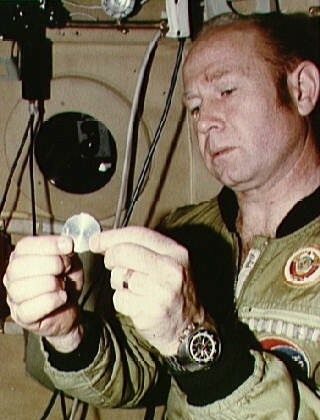 At right is an official NASA picture of Cosmonaut Aleksey Leonev wearing his Flightmaster which appears to be a Stainless Steel c.911 (ST145.036) model. In addition to these widely known examples of the Flightmaster there occasionally appears on the market, typically on eBay another watch claiming to be of the Flightmaster linage. 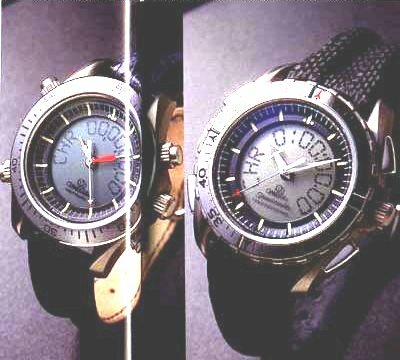 This watch is pictured below at left. 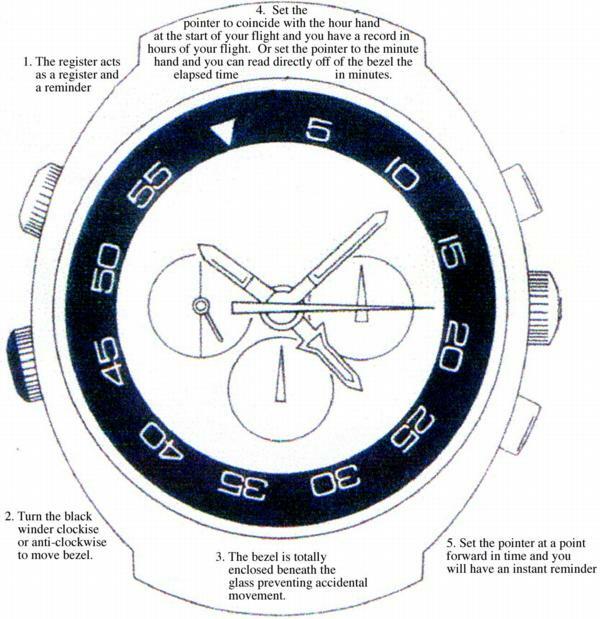 The problem with the "Flat" Flightmaster is that it does not include a vital part of the Flightmaster feature set: the second hour hand. 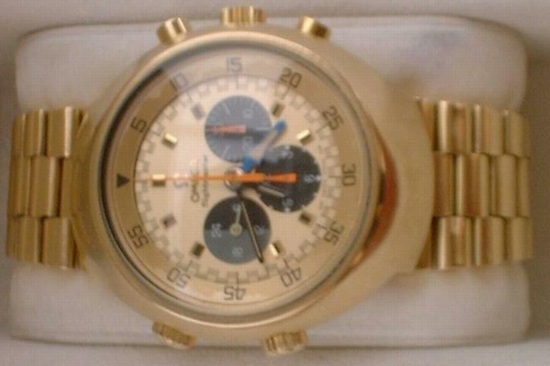 While the "Flat" Flightmaster does include the under crystal bezel, the lack of the second hour hand, and lack of official literature seems to indicate a less legitimate origin for these examples. 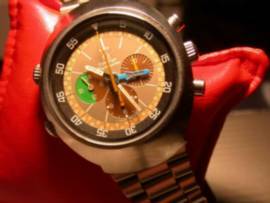 I would not recommend taking a chance on purchasing such a "rare" and probably put-together version. 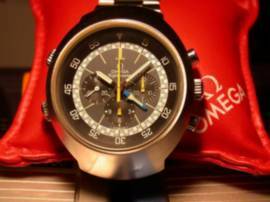 The addition of Ming Thein's photography of his cousin's flighty c.911 adds a great deal to this article, thanks to both Ming and his cousin for making possible their inclusion! 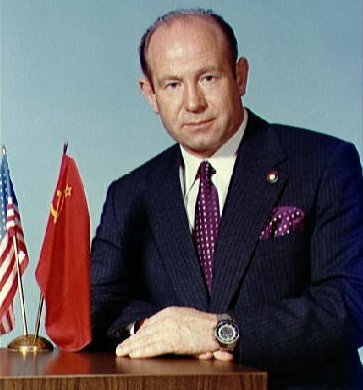 The photo's included in the section on Alexei Leonov are courtesy of the NASA web site. Permission is granted for Eric Katoso, Damon, Derek Ziglar, Frank N., Ross or Robert Jan to include portions within the FAQ's they are writing as long as credit (and a link to this article) is given. 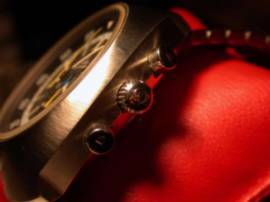 Permission for personal, educational or noncommercial use is granted. 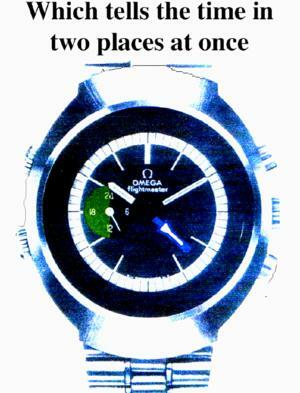 The author retains all other rights not specifically mentioned here... For all other use please contact the author.